This pendant is a plea to the Lord to "bind my wandering heart to thee". An elongated heart is bound with tethers to a delicate cross, making it a the perfect subtle reminder to not allow ourselves to stray away from Christ and his undeniable goodness. Hand inscribed on the back of the cross is the words "Bind My (with a heart symbol)". 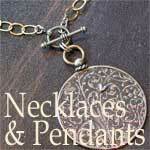 The pendant is 1" tall and 3/8" wide. It comes with an 18" Oxidized Pattern Cable Chain.